A group of would-be sports reporters have turned their website into a supplement for a weekly newspaper. Sports journalism students at the University of Brighton currently publish a website called OvertimeOnline.co.uk which is updated daily with reports and podcasts on national and international sports news, as well as coverage of student sport. Now they have reverse-published it as a four-page insert in the Eastbourne Herald which was printed and sold in the paper’s 13 June edition. A second supplement is planned for this Friday. Eastbourne Herald editor Keith Ridley said: “We already have close working ties with the university and we were delighted to develop that working relationship. “The insert in the paper seemed an ideal way of bringing their work to a wider audience. “Students from the course regularly join us for spells on our sports desk (our head of sport is a former student! ), so this was a good fit for us both. The BA (Hons) Sport Journalism is taught at the university’s Eastbourne campus. The students planned and produced the print edition after applying for a £500 grant from the University. 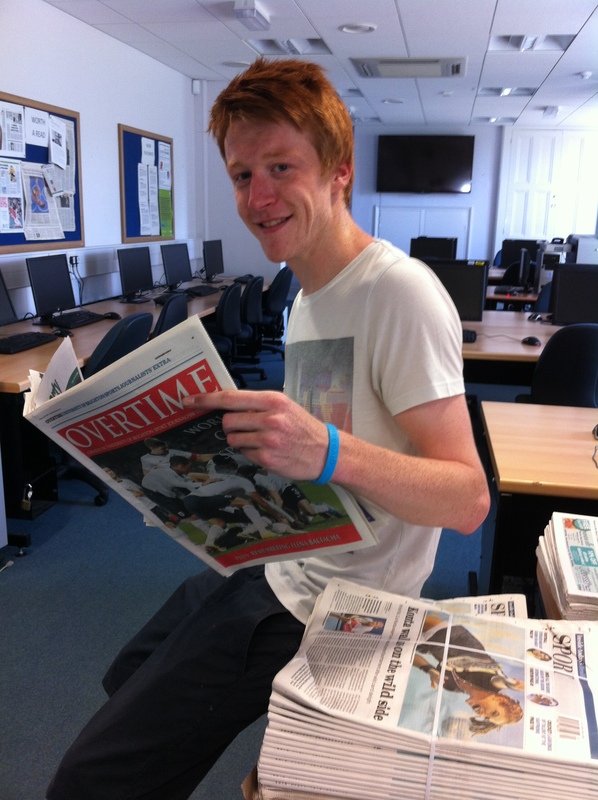 Overtimeonline editor Oli Graham, who is graduating this month, said: “It was great to see our work in print under our own masthead. There is no substitute for the experience of writing and laying out a paper for real. Sport journalism newsroom? They having a laugh? No wonder the business has gone to pot.